I suppose I should be writing about the (super)moon, but yesterday I became captivated by the sun: not the real sun, but a stylized image of a sun in the hands of a “medieval” king on a very cool chair by the twentieth-century Italian architect and designer Paolo Buffa. Said chair, with its mate, was featured in the pages of T: the New York Times Style Magazine yesterday, in an article on French designer Vincent Darré’s whimsical Paris apartment. There’s always something that catches my eye in this well-curated periodical, and this weekend it was the Buffa chair, or more particularly the image on the back of the chair: I tried to find its source–to no avail; I suppose Buffa must have sketched it himself–it looks “traditional” and “modern” at the same time, like many of his designs. 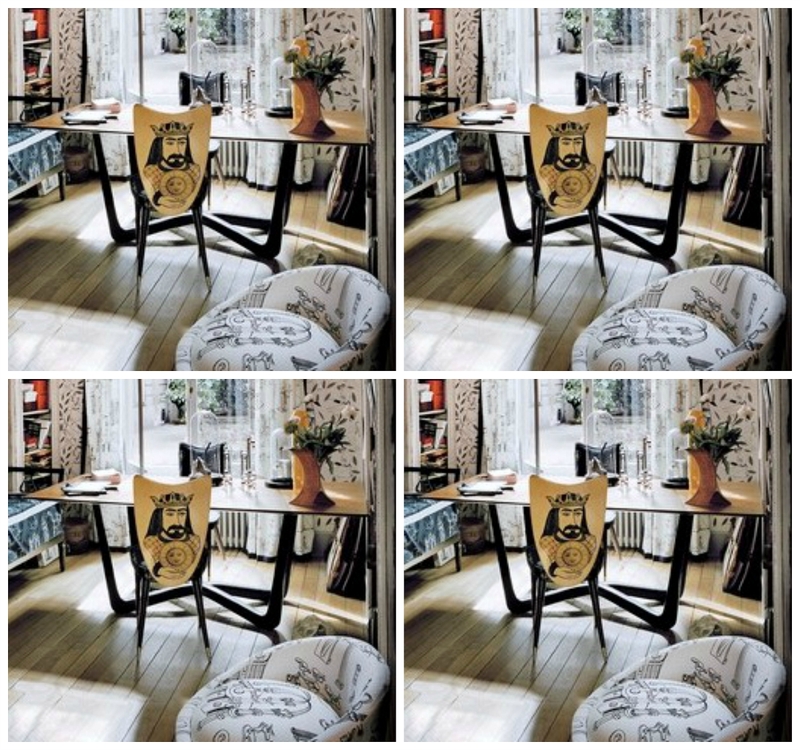 The Buffa chair in Mr. Darré’s study, in multiples: photograph by François Halard for T: The New York Times Style Magazine. I love this chair! I want this chair! But I imagine it’s well outside of my price range (a pair of much less distinct chairs is priced at $5500 here), so after considering the style for a while I moved on to the substance. Because of its obvious splendor, the sun has been utilized by kings and queens projecting their power and magnificence from time immemorial and all areas of the world. The sun is generally utilized as a visual reference–either as accessible symbol or allegorical emblem–but it is actually held, or brought to earth, surprisingly seldom. It takes bravado to do that, like that exhibited characteristically by the Sun King, Louis XIV. From early on in his reign he utilized the sun in myriad ways: basking in its beams, driving its chariot, holding and eventually evolving into it. 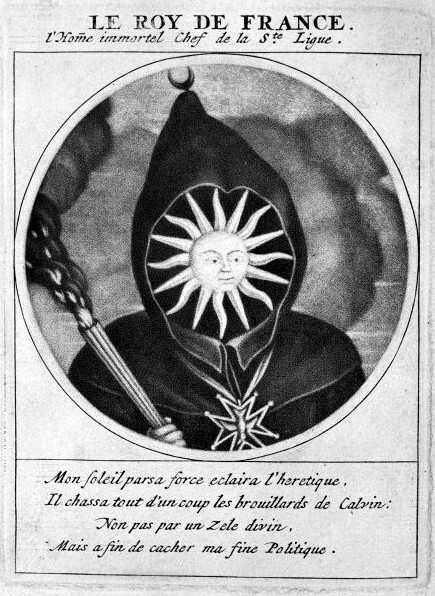 He was identified as the sun by both his supporters and his enemies–among them the persecuted and exiled Huguenots of France who projected him as a sun-inquisitor following the Revocation of the Edict of Nantes in 1685. 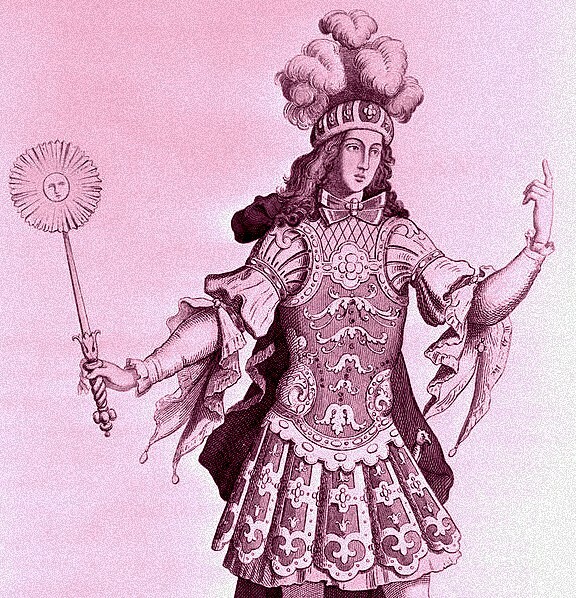 Louis XIV in the costume of The Sun King in the ballet ‘La Nuit’ c.1665; Protestant caricature of King Louis XIV as inquisitor, illustration from ‘Les Heros de La Ligue ou La Procession monacale, conduite par Louis XIV, pour la conversion des protestants de son royaume’, Paris, Chez Pere Peters, a l’Enseigne de Louis Le Grand, 1691; Calendar of Indictments against Louis XIV, 1706, Library of Congress. 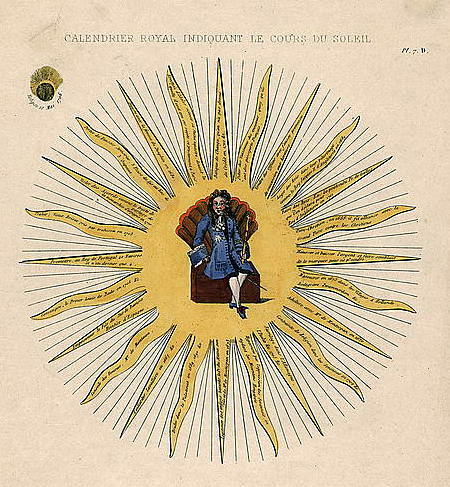 But sun symbolism was not always so straightforward, and certainly not in the seventeenth century, when it could represent not only a king and his mastery of all before him, but also faith and reason: the light of both spiritual and scientific understanding. 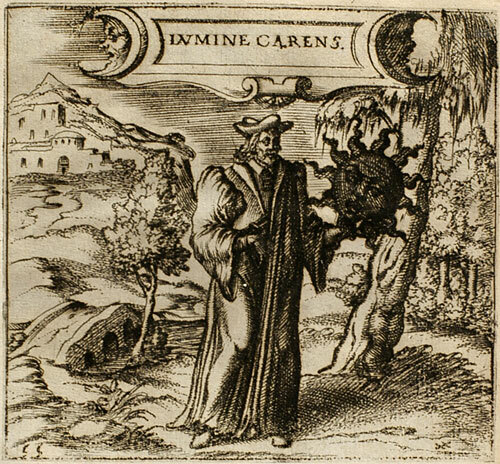 In the very important emblem book of Georgette de Montenay, Cent emblemes chrestiens (1615), the sun goes dark when held in the hand of a philosopher who has abandoned his faith for false theories while conversely another woman–from a bit later in the century, after Galileo’s very public defense of heliocentrism–holds the sun-light of understanding in her hand. 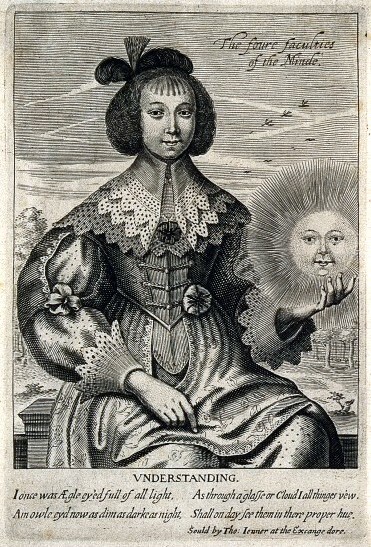 “Lacking Light”, Georgette de Montenay, Cent emblemes chrestiens (1615), Glasgow University Emblems website; A woman holds a sun in her hand; representing the faculty of understanding. Engraving by T. Jenner [? ], c. 1650, Wellcome Library, London.